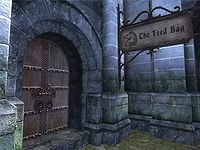 The Feed Bag is a bar in the Imperial City's Market District. It is found across the street from A Fighting Chance and next to Jensine's "Good as New" Merchandise and Red Diamond Jewelry. The publican, Delos Fandas, buys potions and food, while only selling the latter. He has 50 gold and a mercantile skill of 40. Many of the Merchants within the Market District come to the Feed Bag when their shift is over to talk and have a drink. Occasionally, Imperial City citizens can be heard saying: "The Feed Bag isn't fancy, but it fills you up." The main reception area is on the ground floor. 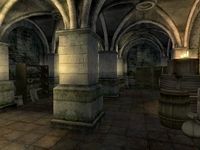 Delos won't rent any rooms; instead, the second floor holds his private quarters, as is usual with Imperial City houses and stores. The basement offers more storage below. 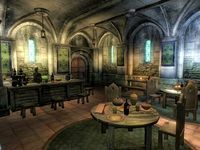 The bar at the main entrance holds three cheese wedges, two ears of corn, two slices of ham, two potatoes, and a loaf of bread, along with five bottles of cheap wine and five bottles of mead. The table on the southwest wall behind the bar holds four heads of lettuce, a watermelon, and three bottles of mead, while the set of shelves beside it holds four radishes, two potatoes, and rice. A clutter barrel and two non-respawning clutter sacks sit in the south corner near the door to the basement. A table against the northwest wall holds another bottle of cheap wine, and a larger table in the north corner is set with four blackberries, three oranges, and another bottle each of cheap wine and mead. Three food barrels and a clutter sack sit in the corner behind the table. Another table on the northeast wall a final bottle of cheap wine and a non-respawning covered bowl that contains food. The door to the private quarters is at the top of the stairs. Delos' double bed, which you are free to sleep in, lies on the southwest wall, with a non-respawning chest that can hold gold and jewelry at the foot. 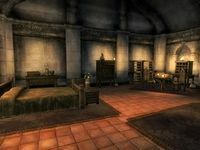 In the west corner beside the bed sits another non-respawning chest, this one with a possibility of armor and weapons, and a chest of drawers that holds clutter. A lectern on top of the drawers also holds clutter. A food cupboard sits on the northwest wall, and a non-respawning clutter sack sits on top of it, with another beside it. A table in the north corner is set with two loaves of bread, two potatoes, a cheese wedge, and two bottles of skooma. A clutter barrel and two more non-respawning clutter sacks sit in the corner behind the table, along with a wine rack sitting on top of a smaller table that holds eleven bottles of cheap wine. In the east corner sits two crates, a cupboard, and a non-respawning sack, all containing clutter, as well as a barrel that holds food. On the first landing of the stairs down into the basement sit two crates and a chest that contain clutter, along with a non-respawning grain sack. Another three crates, a barrel, and a non-respawning sack on the northeast wall of the basement all hold clutter, and a second non-respawning grain sack sits nearby. Another barrel on the northwest corner holds more clutter, as do the two crates in the west corner and one of the non-respawning sacks on the southwest wall; the other holds grain. A final clutter barrel and two non-respawning sacks, one with clutter and one with grain, lie in the southern corner. Esta página foi modificada pela última vez à(s) 01h50min de 18 de julho de 2013.